Analyst Debate: Is ATP Oil & Gas a Top Stock? The Motley Fool has been making successful stock picks for many years, but we Fools don't always agree on what a great stock looks like. That's what makes us "Motley," and it's one of our core values. We can disagree respectfully, and we often do. Investors do better when they share their knowledge. In that spirit, we three Fools have banded together to find the market's best stocks, which we'll rate on The Motley Fool's CAPS system as outperformers or underperformers. We'll be accountable for every pick based on the sum of our knowledge and the balance of our decisions. Today we'll be discussing oil and gas deepwater drilling company ATP Oil & Gas (NAS: ATPG) . ATP Oil & Gas' results have fluctuated wildly over the past decade. Here's a quick snapshot of some figures that will better acquaint you with the company. Sources: ATP Oil & Gas Annual Report; Morningstar; Yahoo! Finance; author's calculations. CAGR = compound annual growth rate. The $64,000 question is: When will ATP Oil & Gas actually make a big enough find that it pulls the company out of a deep trough of losses? The answer to that question could be the Shimshon well in the Levant Basin off the coast of Israel. According to ATP, estimates range from 1.5 trillion (yes, with a "T") cubic feet to 3.4 trillion cubic feet of natural gas in that region. Even with natural-gas prices near decade lows, that is a company-changing find that could actually make ATP relevant again. Despite the excitement surrounding ATP's possible finds off the coast of Israel, we have to remember that two-thirds of the company's revenue is derived from deepwater drills it has set up in the Gulf of Mexico. With the deepwater drilling moratorium a thing of the past, you'd think that ATP would be spilling over with profits, but that hasn't been the case. Rival Ensco has noted that all of its rigs are up and running at the full-day rate. ATP has seen sales and cash flow improve, but not nearly enough to get the company back to an elusive profit. The true detriment to ATP is its crushing debt load. Had it not been for rising oil prices stemming from Iran's threat to block the Strait of Hormuz, ATP may well have defaulted on its debt. With $2 billion in debt, $1.5 billion of which pays a staggering 11.875% interest and is due in May 2015, ATP paid $76.5 million in just interest payments alone in its latest quarter. That's not very comforting, given that it hasn't regularly produced positive cash flow in recent years. 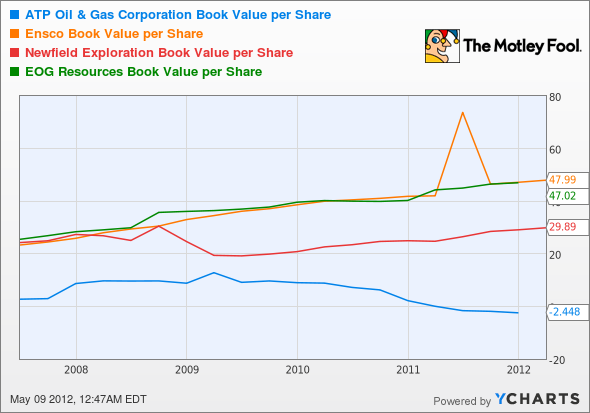 ATPG Book Value per Share data by YCharts. As ATP crushes shareholder value with its frivolous spending while peers like EOG Resources and Ensco continue to produce strong profits, I can't help but be bearish on ATP. Even Newfield Exploration, which has an exceptionally high level of debt relative to cash on hand ($27 million in cash versus $2.92 billion in debt), is raising production guidance and maintaining healthy profits. ATP simply isn't up to par with its peers, and it's not worth the gamble even at these depressed levels. ATPG Revenues TTM data by YCharts. It's doubtless that a heavy weighting toward natural gas in the company's reserves has played a part in keeping things from taking off, but as Sean mentioned, ATP has been out from underneath the boot of a deepwater moratorium for a while, and interest expenses are killing any momentum the company might have generated from consistently high oil prices. Its latest payment is actually down a bit from midyear, but that's hardly much consolation when annual payments ballooned from $41 million in 2009 to $326 million last year. Nearly half of the company's undeveloped reserves lie under the North Sea, which ATP has been waiting to tap for more than five years. It won't be going anywhere until 2014, which is a really long for a company to wait before reaching the other half of its potential. 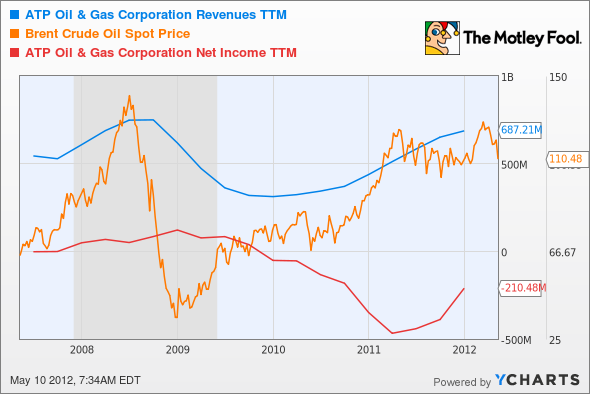 Contrast that with Kodiak Oil & Gas (NYS: KOG) , which has taken off from nothing in the time it took ATP just to get back to its pre-recession revenue highs (and without the pre-recession profitability). Kodiak sticks to dry land, and it has boosted its developed reserves nearly fourfold in just one year, with much of that from an increase in oil production. ATP, on the other hand, boosted total production by just 17% over the same time frame. Both are running at high levels of infrastructure investment, and both took out big loans to do so, but only one company seems to be reaping quick returns from that borrowing. With plenty of high-growth drilling stocks to invest in that have shorter time horizons for their projects, focusing on one that will not realize its full potential for years seems a poor use of valuable portfolio funds. I'm not saying ATP is a guaranteed stinker, and it may be worth placing on your watchlist if you're patient enough. But it doesn't look like a great buy right now. I'm tired of companies that dangle hope in front of our faces, only to disappoint when it's time to perform. ATP says that production is picking up at Telemark, Clipper will begin production in the late third or early fourth quarter, and Israel is a gold mine waiting to happen, but I want to see results. ATP reported $210 million in losses last year and $349 million in losses the year before. Analysts are expecting a $2.19 loss per share this year and another $0.82-per-share loss next year, and those estimates are only getting worse. The expected losses are bad, but what really makes me worried about this stock is the balance sheet. $2.1 billion in debt is a lot, especially when the market cap is only $369.4 million. Then there's the price of oil and natural gas to consider. I'm not a fan of natural gas going forward, simply because I think there will continue to be too much supply domestically, and prices will remain low. Internationally, prices are higher, but shale drilling has just begun in the area, and natural-gas exports from Cheniere Energy's (ASE: LNG) export terminal could level prices. I'm also wary about betting on oil prices right now, because threats from Iran appear to be dissipating, and a weak economy in Europe will keep prices from rising too fast. In the oil and gas industry, reserves are great, but eventually you have to put up the financial numbers to back them up. ATP has built up a nice pile of reserves, but its balance sheet requires perfection in turning those reserves into production. I'm just not willing to bet on perfection, and I think we're more likely to hear about a dilutive share offering before we hear about blowout earnings. With all of that said, ATP has proven it can pop on a moment's notice, so I'm wary of an underperform call. I'd prefer to watch ATP from the sideline. Despite all three of us sending markedly bearish words ATP's way, the consensus appears that it's best to leave ATP be at the moment. With high levels of short interest and a mountain of natural-gas reserves potentially buried below its drill sites, the possibility of a short squeeze is very real. All of us, however, realize that fundamentally, the company hasn't done much to prove its worth to investors. For now we'll file this in the "avoid" category and put it up for further review as necessary. For our previous selections, feel free to visit out CAPS portfolio at TMFYoungGuns and drop us your thoughts in the comments section below. ATP Oil & Gas may not have whet our appetite, but our top-notch team of analysts has identified three must-own stocks for $100 oil. Find out the names of these stocks by clicking here to obtain your free copy of our latest special report. At the time this article was published Fool contributors Sean Williams, Alex Planes, and Travis Hoium hold no financial position in any company mentioned here. You can follow Sean at @TMFUltraLong, Alex on Twitter at @TMFBiggles, and Travis at @FlushDrawFool.The Motley Fool owns shares of Ensco. Try any of our Foolish newsletter services free for 30 days. We Fools may not all hold the same opinions, but we all believe that considering a diverse range of insights makes us better investors. The Motley Fool has a disclosure policy.